Converts an L5-30 to an RV receptacle. Use this device with your Honda EU3000i generator or two EU2000i generators in parallel (using parallel kit Model 30501A) to power your RV or camper. 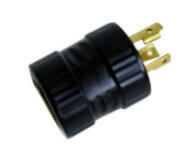 The NEMA L5-30 male plug connects to the generator or parallel kit and a 30 amp 125 volt RV receptacle accepts the RV plug from your RV or camper. For 125 volt use only. UL Listed.